The leader of Venezuela’s armed forces declared loyalty to President Nicolás Maduro on Thursday and said the opposition’s effort to replace him with a transitional government amounted to an attempted coup, while Vladimir Putin telephoned Maduro and “emphasized that destructive external interference is a gross violation of the fundamental norms of international law,” as the New York Times’ Ana Vanessa Herrero and Neil MacFarquhar report. Dive Deeper: “Critical Questions: Juan Guaidó: Venezuela’s Interim President,” by CSIS’s Moises Rendon. “Venezuela: The Rise and Fall of a Petrostate,” via CFR’s Rocio Cara Labrador. Satellite images suggest that Saudi Arabia has constructed its first known ballistic missile factory, according to weapons experts and image analysts, a development that raises questions about the kingdom’s increasing military and nuclear ambitions, as the Washington Post’s Paul Sonne reports. The United Nations special rapporteur on extrajudicial, summary or arbitrary executions told Reuters on Thursday she will travel to Turkey next week to head an “independent international inquiry” into the murder of Saudi journalist Jamal Khashoggi, as Reuters’ Stephanie Nebehay reports. The U.S. offered $20 million in emergency aid to opposition leader Juan Guaidó’s side and requested an emergency meeting of the United Nations Security Council on Saturday on the Venezuela crisis. 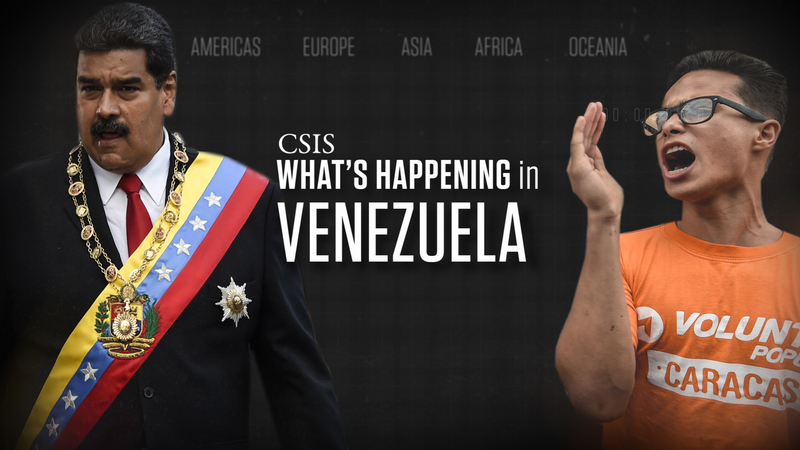 CSIS's Moises Rendon explains the humanitarian crisis taking place in Venezuela. Check out the short video, "What's Happening in Venezuela," here. The Andreas C. Dracopoulos iDeas Lab at CSIS enhances our research with the latest in cutting-edge web technologies, design, and video.The Andreas C. Dracopoulos iDeas Lab at CSIS enhances our research with the latest in cutting-edge web technologies, design, and video. (Photo Credit: Mark Wilson/Getty Images). 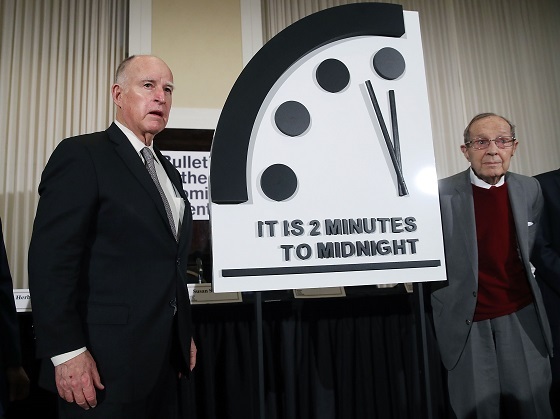 Former California Governor Jerry Brown, (L) and former U.S. Secretary of Defense William Perry unveil the Doomsday Clock during The Bulletin of the Atomic Scientists news conference today in Washington. This year, the Doomsday Clock remains unchanged and is set at two minutes to Midnight. “Iran’s Revolution and the Problem of Autocratic Allies” by Brookings’s Tamara Cofman Wittes. At 10:00 a.m., The Middle East Policy Council (MEPC), will host a panel discussion featuring CSIS's Jon Alterman. He and other experts will provide a mid-term assessment of the Trump administration’s Middle East policy. CSIS held its latest installment of its Schieffer Series yesterday, covering the U.S. withdrawal from Syria and Afghanistan. CSIS experts and guest panelist provided insight and context to the recent decision, and assessed the effect of these decisions on regional stability, as well as the consequences for U.S. national security. Watch the full video here. Images of migrants charging the U.S. border obscure a larger trend. Many Mexican and Central American migrants are returning home, whether they want to or not. Andrew Selee, president of the Migration Policy Institute, returns to talk about who is coming and who is going. Check out this latest episode on 35 West. Thanks for all of the great emails about the potential soundtrack for “The Many Saints of New York.” In addition to my Frankie Valli bet, I wager that the Jefferson Airplane’s “White Rabbit” is going to make the cut. This 1975 live version is by the Jefferson Starship but it’s so gritty that I couldn’t pass it up. And don’t give up early on this one, Grace doesn’t disappoint.